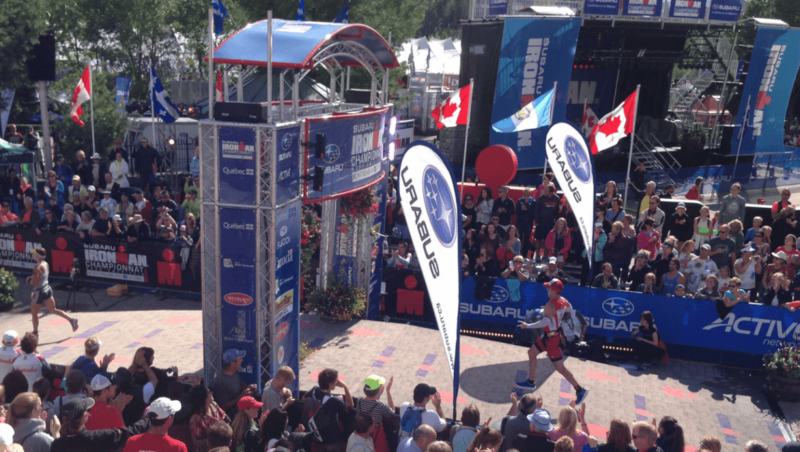 Welcome to the Endurance Nation Race Strategy page for Ironman® Mont Tremblant! Our goal here is to get you 100% up to speed and ready to have your best race possible. Every single race is unique, and Ironman® Mont Tremblant is no exception. The Town totally embraces the race…there’s even a line painted on the road for the run…and a permanent office down by the swim start to educate athletes about the race. From the single loop lake swim, to a the incredible bike course with only one pothole and a great climb to Lac Superior, and the challenging run alternating between the bike path and hills you’ll never forget…Mont Tremblant has it all! Don’t have time time to dive into a full review of the course? Then cover the most important highlights in this short video with Coach Patrick from Endurance Nation. A race in late August is nearly guaranteed to be warm and you can expect humidity. Our general guidance, for nearly every race, is to bring everything you think may need, even if you’re pretty sure you may not need it! In short, be prepared for any and all weather conditions. The Swim: The lake swim will be wetsuit legal, and we recommend a full wetsuit (it won’t be too hot). It’s a single loop swim, which is longer than most competitors will have done. And the lake is quite long, so if the wind’s right, it could really make for a choppy swim. Tinted goggles, please! The Bike: The course is a mix of climbing and time-trial riding, so you’ll need to be prepared for both. Bonus that the roads are so smooth, you enjoy the ride no matter what part of the course you are on. There are early rollers and one singular hill on 117 that require patience. But the climb out and back (and UP and DOWN to Lac Superior is the real deal. There are plenty of sections with grades north of 10% — even a section with 15%. What takes you 40 minutes to climb only takes 15 minutes to descend, so have fun! For gearing, we nearly always recommend a compact crank (50/34) or “super compact” (52/36) if you’re a bit of a stronger rider on an 11 speed bike. For Tremblant, everyone should have at least a 27- or 28-tooth cog on their cassette (for example, a 27-11 for stronger riders), with less strong riders, always benefiting from a 28t or higher (for example, a 28-12 cassette). In addition to managing the hills, you’ll need to be comfortable descending. Be sure to practice on your local roads and a little bit on race week as well! The Run: This course is a great mix of climbing and running on a former rail trail. Each loop starts and ends with climbing — so be smart — but in between, you can stretch you legs on the bike path. There’s a slight descent out / false flat back, so don’t think your mind is deceiving you. Your overall experience here will be dictated by both of your bike pacing and the weather. Hot days will make things much harder (but a safer bike) but some clouds certainly wouldn’t hurt your run performance! The Mont Tremblant swim is a one-loop affair in Lake Tremblant, from a beach start. You’ll swim directly out from shore about 1800m, turn right and swim about 200m, turn right again and swim the remainder back towards the separate swim exit area. Please Note: By the time you exit transition at the mount line, you will have covered more than a 1/2 a mile! >>View the online map here. Area 1: Montee Ryan Out to 117 — This is your first chance to blow the entire race. IGNORE the hammerheads and others racing, be safe and just get out to 117. The hills are steeper on the way out, and as a result, will take more work than you should be ready to give. Same drill when you come back into town and start lap number two, but you’ll be much more tired. Area 2: 117 Out/Back + St. Jovite — If you reference the bike course profile, you’ll see the rolling to a flat section that is 117, book-ended by two climbs (same climb just either side). On the way out, you have a 3-mile effort at roughly 3% to 4%. On the return trip, this climb is just 1.5-miles long, but more like 5% to 6%. Area 3: Montee Ryan In (From 117) — After your “free” early miles you’ll turn right on Montee Ryan when you start to work your way back towards the resort of Mont Tremblant. You still have to climb, but these hills are steady with fast descents. Manage this section properly and you’ll be able to carry your momentum halfway up the next climb. You’ll hit the rotary just outside the resort with the DJ / party…and then it’s off to do the serious work. Area 4: Out / Back to Lac Superior — After a short hill — hey, not so bad! — you are slapped with the meat of this climbing section. It’s a two-mile effort with grades between 3% and 8%. After each mini-climb, the road will level out but it never really drops off to give you a true chance to recover before the next climb. You’ll enjoy a break of about a mile of climbing with grades up to 4% before you hit the double-whammy steep climb just shy of the turnaround. Think 6% to 8% into a 10% to 12% section with a kick up to 15%. Easily 95% of the field will have to stand here to not fall over. Once over that hill, you have a brief chance to recover before one more small hill and the turn around. Then it’s flip it and bombs away down the entire section. >> View the online map here. Area 3: Old Tremblant Back to the Resort / Turnaround / FinishArea Once again you have to climb back into the resort, but like the bike, these hills are steadier and less steep than when running them outbound. Enjoy the descent sections and watch your heart rate. Just put your head down in the last mile. You have two tough climbs, the first you saw on the way out but the second is a new one that comes at miles 13 and 26 as you navigate into the heart of the downtown section to either start Lap Two or hit The Finish. Just. Keep. Moving. You’ll stay right to head to the finish, enter the proper downtown area and fly downhill towards the stands and the finish line. Enjoy and don’t forget to live it up in the chute. The finish line in Mont Tremblant is quite spectacular; do your best to get out here and really soak it up all the way to midnight!